For Week 2 of the 4-Week Meal-Prep Challenge, LIVESTRONG.COM and MyHealthyDish are sharing an easy recipe for a delicious and nutritious make-ahead lunch. Baked salmon with quinoa and asparagus is a speedy, balanced meal rich in omega-3 fatty acids and B vitamins, not to mention a great source of protein. The best part about this recipe? It can easily be adapted to satisfy a wide range different tastes. Just follow the basic formula — protein + grain + vegetable — and you can set yourself up for a week of clean lunches and still feel pleasantly full after every meal. Don’t like fish? Swap in chicken breast. Prefer brown rice over quinoa? No problem! Have a bunch of broccoli or cauliflower in the fridge? That’ll be just fine. No matter what combination you settle on, this delicious soy sauce-and-honey marinade is sure to pack a punch. 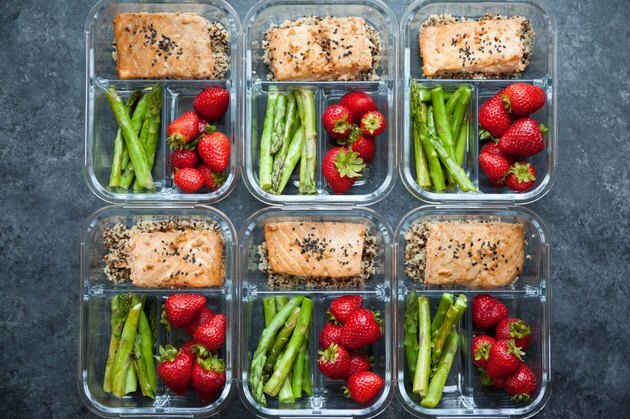 For an easy grab-and-go lunch option, we recommend portioning the food into convenient glass bento boxes as soon as you finish the meal-prep process. And don’t forget to satisfy that pesky sweet tooth by adding some fruit on the side. Fell off the meal-prep train but still want to keep the day’s lunch healthy? Check out these 20 on-the-go lunches set to keep you on the right track! Will you be making this recipe? What is your favorite source of protein? Do you have any tried-and-true make-ahead lunch recipes?